The Homeowners contemplated how to expand the usable square footage of their home without actually adding an addition. They wanted to try to use their existing square footage more wisely and to incorporate a getaway for their teenage daughter along with a place they could enjoy with family, friends and by themselves. Clearly the answer was to look at a Basement renovation. HVAC duct work, oil tank, furnace, well equipment, etc. and still maintain their budget. The first order of business was to locate all the existing problem conditions and start designing a layout that could fulfill their needs. A storage area was partitioned off to allow for an inexpensive shelving system to support all their belongings and so the Homeowner could access them without a struggle. Two storage closets were constructed with main aisle ways with lighting and partitioned off from the balance of the Basement. Next the Media Center had to be open and dramatic, with custom built-in cabinetry to house the sixty inch flat screen TV and the surround sound audio equipment and artifacts. The subwoofer was housed at the complete opposite end under the stairway inconspicuously concealed by a cold air return grill. But the Media Room had a black eye – an existing sanitary sewer hanging down from the floor joist ceiling above and exiting the Basement wall to the septic system. This could not be relocated but the solution – build a matching custom cabinet to add much desired storage capabilities, but more importantly, house the sewer piping. The design for the Kitchenette and Powder Room was critical since we could not construct them in such a manner that would cramp the utilities which then could not be properly serviced or replaced when required. Even the Powder Room had one wall consisting of mirrored sliding glass doors which allowed plenty of access as needed to underneath the stairs. The Kitchenette provided entertainment with its wet bar, microwave drawer and a full size refrigerator. The lighting always becomes a critical component since the goal was to not have anyone feel like they were in a Basement. The electrical panel was in the Garage, so an electrical channel along with a new subpanel in the Basement provided for the functional and decorative lighting, audio visual and appliances. A glass door leads to a beautifully lighted stairway which makes you immediately feel like this is the continuation of the home rather than the Basement. The open stairway at the bottom gives you a feel of a Great Room with the Audio Visual cabinetry artistically lit along with the Kitchenette and its matching custom cherry wood cabinetry. Immediately to the right from the stairway is a discretely placed Powder Room with its matching ambiance. 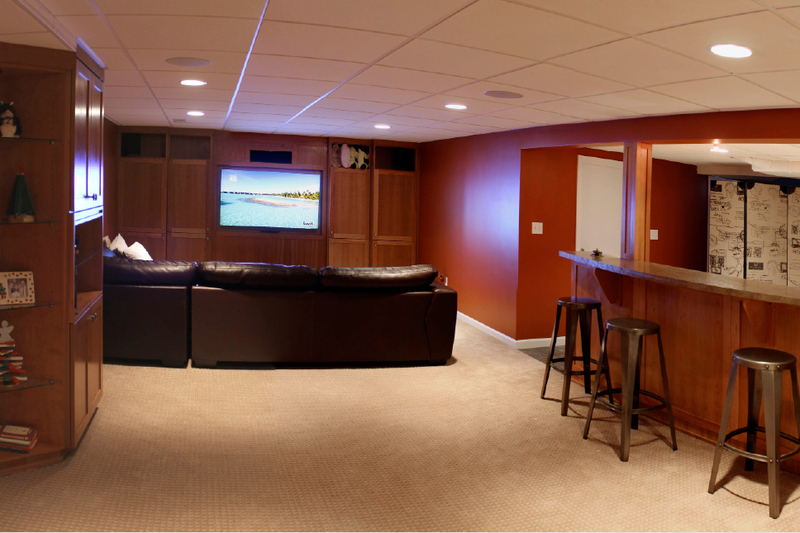 The guests and Homeowners are “WOWED” by the results of this Basement renovation without even realizing the clutter stored behind the tastefully finished storage wall.